In early October I was sent to represent the Scholars’ Lab at the Bucknell University Digital Scholarship Conference and the pre-conference meeting. This conference brings together an interdisciplinary group of students, teachers, scholars, librarians, and instructional technologists for a weekend of conversation about many aspects of digital scholarship including pedagogy, community outreach/social justice, and institutional best practices. This year’s conference was called “Looking Forward, Looking Back: The Evolution of Digital Scholarship” and featured keynotes by Stephen Cartwright, Kalev H. Leetaru, and UVA’s on A.D. Carson. Pre-conference plan: How do we engage students in digital scholarship and support instructors as they incorporate DH or DS practices in their traditional classes? The BUDSC pre-conference was initially convened around these concerns and charged with the task of developing a “DS Cookbook” featuring ideas, best practices, and resources for instructors looking to include digital projects within their courses. We were initially asked to reflect on questions about our own experiences: What would have been helpful to know the first time we attempted to use digital scholarship in the classroom? How can we engage students in digital scholarship with limited budget, resources, or support? Some of these issues had to do with the intended purpose of the pre-conference – creating a guide for those interested in engaging students with digital scholarship (early concerns included: how do we scaffold or assess digital projects? What does it mean when administrators want students to have “digital literary” or “digital fluency?”) But it became immediately apparent that the interests of this group had a much wider scope. Our morning session consisted of sorting all of the issues raised on this initial whiteboard into categories that we could work with more easily, as well as discussing and sharing resources that we all had at hand. In our afternoon session, we broke up into small groups to work on articulating major questions, a list of best practices, and a set of helpful resources for approaching these topics in a variety of contexts. Communicating with Stakeholders: This group provided strategies for talking with administrators and other stakeholders about the value of collaborative digital scholarship, how to find funding for cross-disciplinary work, and how to communicate about DH work as part of promotion and tenure. They suggested that A Short Guide to the Digital_Humanities can be used as a helpful introduction to digital scholarship for administrators and faculty who are unsure of what they may be getting themselves into. MLA also has some guidelines for evaluating digital scholarship for P&T purposes. Data Security & Privacy: This group explored a whole set of questions that I, frankly, had never thought about in any great depth. They asked us to consider, “What exactly is data, anyway? What do we consider to be data in the context of digital scholarship? As we delve more into the world of digital scholarship, it’s become evident that so much of what we do is based on some form of data – be that numerical data, textual data, geospatial data, audiovisual data, etc. With that in mind, how do you ensure ethical, responsible creation and maintenance/preservation of datasets?” The Data Curation Centre can supply researchers with expert help on this topic. This group also suggested Purdue’s Digital Retention Policy as a model document for schools or departments wishing to develop their own protocols regarding data. IP/OA/Fair Use: This group explored how to approach fair use and copyright as our students use, remix, and edit online content for their own projects. We can begin by assessing our own/our institution’s tolerance for risk. Very important take-away point: No one is carting you off to jail for remixing something – the worst that will happen is a take-down notice. There’s also an increasing amount of legal precedence for going a little cowboy with fair use, as demonstrated by this video which not even Disney was able to successfully remove: A Fair(y) Use Tale https://www.youtube.com/watch?v=CJn_jC4FNDo. Sustainability: The questions of project management, project charters, sunsetting, hosting, institutional repositories, and archiving looked like a separate category for us at first, but discussions of these issues were interwoven throughout the other four categories, rather naturally. Shout outs here went to Reclaim Hosting and Miriam Posner’s blog post on Project Charters. N.B. quotations are from the co-authored pre-conference documents. Cite this post: Kelli Shermeyer. 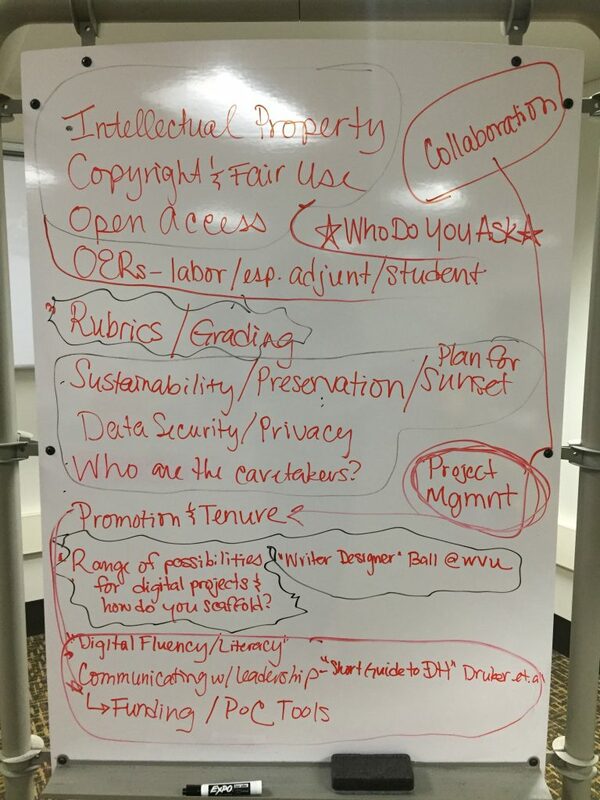 ““All of the Questions:” A Recap of the 2017 Bucknell University Digital Scholarship Pre-Conference”. Published November 30, 2017. https://scholarslab.lib.virginia.edu/blog/all-of-the-questions-a-recap-of-the-2017-bucknell-university-digital-scholarship-pre-conference/. Accessed on .